Wayfinding signs should be used along the route to indicate a designated bicycle route to specific destinations. These signs may also act to promote bicycle use to non-cyclists who may have never considered bicycling to destinations listed on the signs. Short connecting pathways, such as through neighborhood parks, or at the end of cul-de-sacs, help to continue the bike route where the local road ends and separates the bicycle route from motor vehicle traffic. Rain gardens, bioswales and permeable pavement may be integrated into the streetscape to improve water quality, storm water, and heat island issues as well as creating an inviting street. Enhance the street with neighborhood art. A mix of on-street pavement markings, signage and other artistic means can be used to designate the street as a Nice and Easy Bikeway. Provide safe road crossings at major roadways through crossing islands, bike boxes, pavement markings and other special bicycle crossing techniques. Learn more from NACTO.org. Orient stop signs to reduce the number of times a bicycle has to stop along a designated bike route. Learn more from NACTO.org. Providing curb extensions and neckdowns at intersections shorten the crossing distance for pedestrians and slow motor vehicles approaching the intersection. Learn more from NACTO.org. Medians are a physical barrier in the roadway that can be used to slow motor vehicles. Learn more from NACTO.org. Mini Traffic Circles can be placed at intersections to help slow motor vehicle speeds and provide limited delays for bicyclists. Learn more from NACTO.org. Pinchpoints and chicanes help to reduce motor vehicle speeds by narrowing the width of the road so only one vehicle may pass through at a time. Learn more from NACTO.org. A channelized island helps to reduce traffic volumes by forcing motor vehicles to turn while allowing bicycles and pedestrians to continue straight through the island. Learn more from NACTO.org. Partial lane closures are used to reduce traffic volume by restricting vehicle access at an intersection to one side only while allowing bicycles full passage. Learn more from NACTO.org. 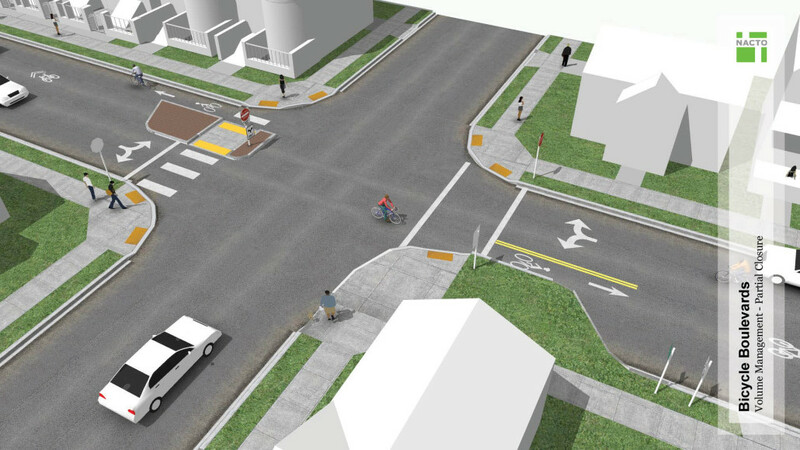 Diagonal diverters help reduce traffic volume by requiring all motor vehicle traffic to turn, while allowing bicyclist and pedestrian through movement. Learn more from NACTO.org. Full lane closures prevent motor vehicles from continuing on a bicycle route while bicycle travel can continue unrestricted. Learn more from NACTO.org.